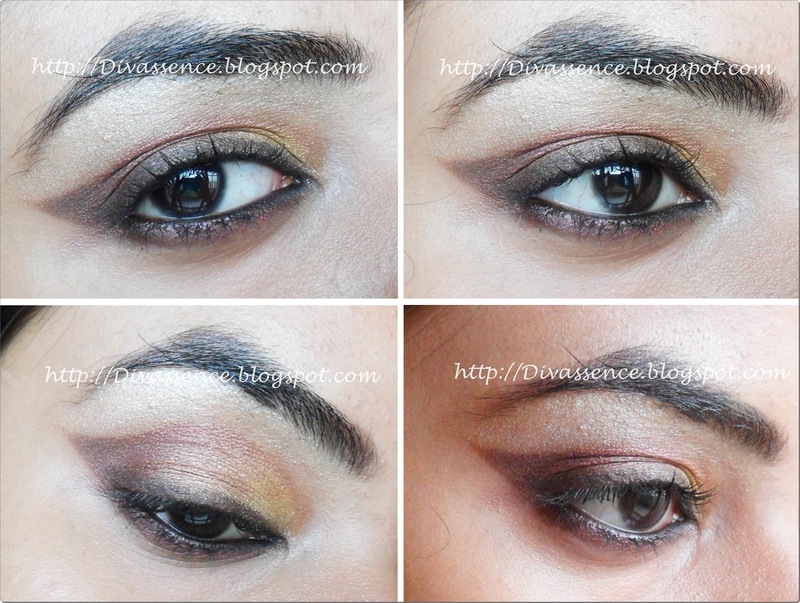 Kareena Kapoor’s Heroine Inspired eye makeup tutorial - Divassence! Today I will be doing an eyemakeup inspired by Kareena Kapoor’s latest flick, Heroine !! When Deeps and I were discussing, she asked me to do this tutorial. So, without any delays, I did my version of her makeup. If you can notice, she has this very intense vampy style smokey eye using dark brown, cranberry and golden eyeshadows. If you think of these colors otherwise, you can easily incorporate them in with any of your Indian dress, because these colors suit perfectly. I primed my lids using a tiny drop of Inglot duraline, blended it and waited for it to dry. After that I patted some golden shadow all over the lid. Using duraline as base helped not only intensifying the golden shadow, but also acted as a base. Then using a fluffy brush, I blended some cranberry shadow over the socket area, to add a wash of color. Then taking the same fluffy brush, I filled the outer ‘v’ with the dark brown eyeshadow, and a bit of black to deepen the crease area. Make sure to blend it well with the cranberry shadow. I took the flat angled brush, and swept some black eyeshadow along the upper lash line to get a smoked liner. Now for those, who think they’re not happy with the shape (I will still be happy if I do not consider the reference pic), they can go ahead and take a q-tip and clean and get the desired shape to get that crisp form and outline as that of Kareena’s. This is how It looks after cleaning and getting that shape. This is how it looks finally , after filling in waterline, highlighting brow bone, filling in brows and using a mascara. Hope you like the look! ← Saarisha: My online jewellery store! thankuu niesha 🙂 acid palette is good but some of the shades are quite difficult to work wid..
you have totally nailed it Ups ..fab!